Seeking Ali was adopted by Mary and Brian Bailey and niece, Breanna. This happened so fast at our GAGC Family Picnic. The Bailey's had lost their first greyhound, GEORGE recently who was always such a happy boy and has been really missed. 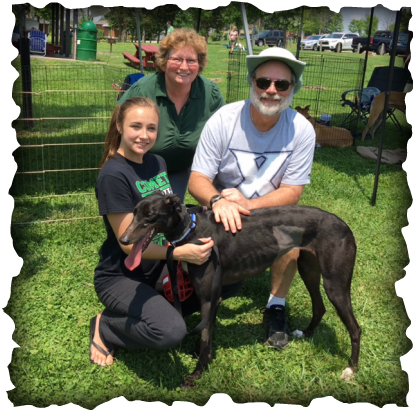 Brian and Mary came to our picnic and struggled a bit seeing all the hounds, well they were looking at the foster dogs and asked to meet Ali, WELL they during this meeting they fell INSTANTLY in love and the adoption papers were signed and she went HOME! I am positive you'll see a lot of Ali at the future events, this family has always supported GAGC for years in the past.